Last month we got as far as assembling the end panels and making the curved lower rails at front and back. The top, mid and lower panels are already glued together as blanks awaiting accurate sizing. 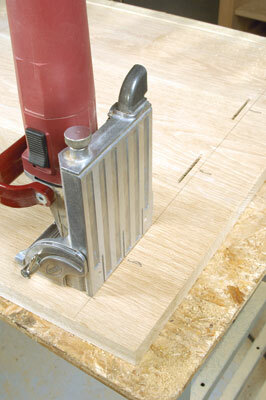 The first task is to run a groove down the back inside legs to take the one-piece back panel. This should be centred on the legs and the lower rail Domino slots. 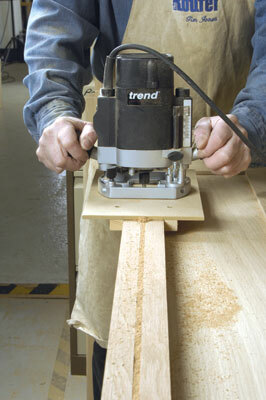 A simple sub-base needs to be made up for a router so it fences against both leg sides. 1 Using two standard router fences means one will rise up on the panel rails and give an inaccurate cut, hence the need for a home-made solution. The datum that will determine the distance apart for the carcass sides is the length of the curved lower rails at front and back. Lay one end panel down on the bench and dry fit the lower rails. The carcass bottom is biscuited between these rails so you can now measure the exact width required where the rails join the side, then saw and plane to width. 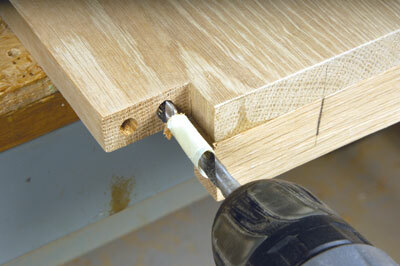 The carcass bottom needs to rest against the lower side rail and must be notched to fit around the legs. 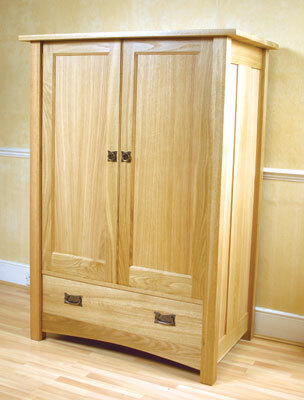 Alternatively you could cut into the legs and keep the panel end completely square but I chose not to do this. 2 Sit the panel so it rests on the legs and mark the width of the notches, then mark up the panel on each side to complete the notch shape. Cut out carefully with a fine-tooth saw. Check the fit and adjust if necessary. Carefully calculate the length of the panel. Cut to length and repeat the notching out at the other end, using the opposite panel as your reference for an accurate fit. Make sure each end is marked to match its respective end panel. It is now possible to cut the middle panel to fit. This sits over the drawer and fits between the muntins. Again it needs to be notched around the legs, but obviously the length will need to be checked carefully for a neat fit. This panel should be flush against the back panel groove and at the front it should either be flush or, better still, slightly proud of the doors and drawer front when they are in place. 3-5 Both the panels have cross rails, on the underside of the middle panel and the top side of the lower panel. These act as guides for the drawer when it is in place. The lower panel also has the lower front and back rails attached to it. No.20 biscuits are used for all these joints along with PVA glue. Cramp carefully and check for square while the glue is wet. 6 The centre panel is fixed in place with two No. 20 biscuits into the muntins at each end and dowelled into the legs. 7 Since the side, front and back panels are cut from one sheet of oak-faced MDF it isn't possible to make the back panel from just one piece. 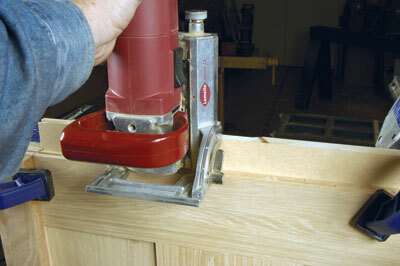 The technique I use is to centre a biscuit jointer accurately in the middle of the MDF and set for '0' biscuits. 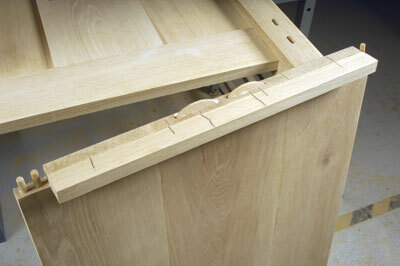 Even though the panel is thin this does work and the join can be behind where the drawer is in any case. 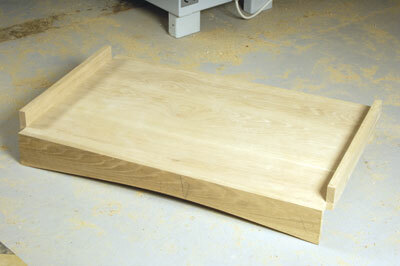 8 Now assemble the carcass with glue, on its side, on a bench so you have overhang for applying cramps. Although assistance is a good idea the whole process isn't particularly stressful so long as everything is correctly machined, but you may wish to check by doing a dry assembly first. 9 Stand the carcass the right way up and cramp in the top rear of the sides, until you have the same measurement at top and bottom of the carcass. 10-11 You can then transfer this width plus the correct depth onto the underside of the sized top, ready for biscuit slotting with No. 20s. This is done freehand to a line although you can clamp on a batten. 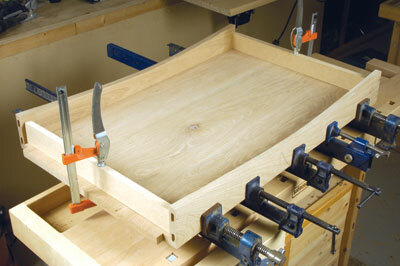 To biscuit slot the carcass, clamp a batten against the carcass sides in turn to act as a reference surface. Belt sand the top, then random orbital sand the top and carcass entirely before fitting the top. Glue, biscuit and cramp it down with long sash cramps, ensuring it sits tight on the carcass. 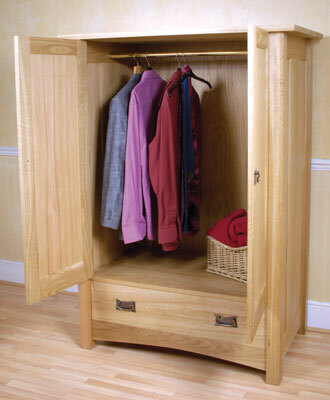 The plain drawer front is attached to a box which consists of two sides that overlap the front and back. These are tongued into grooves in the sides. 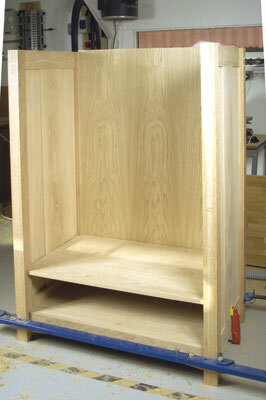 A similar groove around the base of all these components carries the oak-faced MDF drawer bottom. 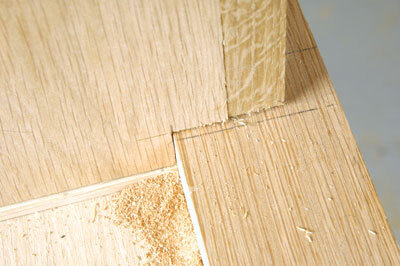 12-13 The doors are made using a one-piece combination decorative-frame router cutter. 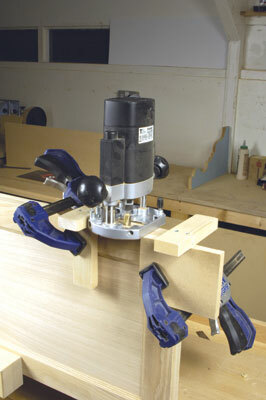 It needs a 1/2in-shank router and makes both scribe and profile cuts by raising or lowering the cutter in the router table. 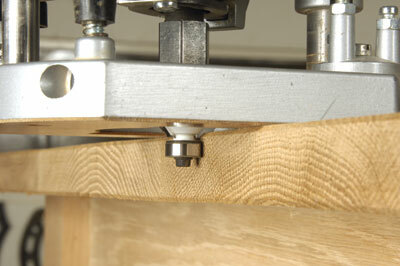 Note that one of the inner stiles is wider to allow the use of a bead-edge cutter, not only for detail but also to disguise discrepancies where doors meet. 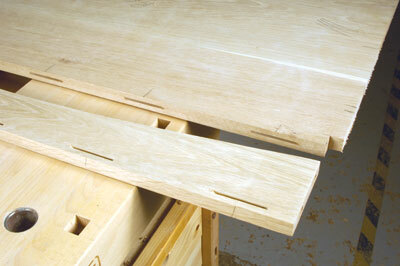 The rail dimensions arrived at thus: inner carcass width, minus bead edge width, divide by two equals door width. 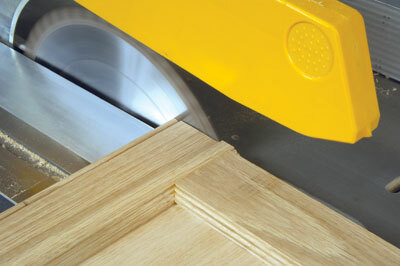 Then: door width minus two times stile width, plus cutter depth (19mm) gives rail length. 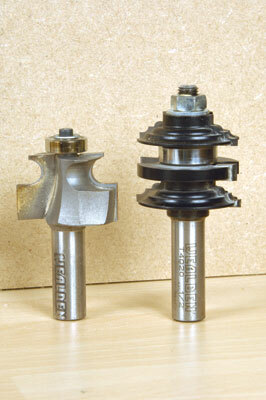 Example: 435mm-140mm (70mm x 2) = 295mm + 19mm = 314mm (rail width). One stile also has the bead edge which is another 12mm approx. Now sand the profiles and grooves lightly and cut the oak-faced MDF panels to fit. Glue up and cramp, checking the doors are square. 14 Once dry, trim off the 'horns', try the doors in the carcass and trim to fit. The inner meeting edges are relieved back at an angle of 5 degrees to clear each other when being opened. Sand all round. 15 The doors open to 90 degrees between the legs so the hinges cannot be let into the legs, only into the doors themselves to slightly less than the folded hinge thickness. This job requires the router and a simple jig. 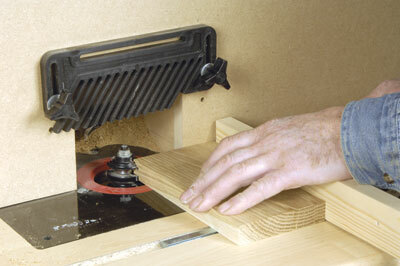 Place a folded hinge three-quarters under the router depth stop, press it down and lock. This is your recess depth. Machine from both faces to avoid tearout. Check the hinge will fit. 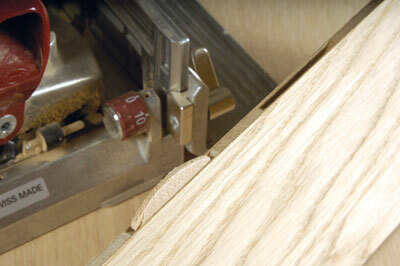 16 The last machining job is a small chamfer on the edges of the top and a larger one around the bottom of each leg. Lightly rub these edges with abrasive paper. Finally apply a sanding sealer all over, rub down and wax, then fit the hardware to complete this piece. 17 Don't forget the all-important hanging rail. "To biscuit slot the carcass, clamp a batten against the carcass sides in turn to act as a reference surface"
- The only way to check the length exactly is to assemble both ends onto the rails using a piece of wood the right length to hold the top ends apart - you may need help with this. It may be necessary to trim the panel length a fraction for a snug fit.